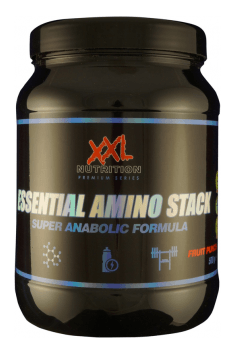 XXL NUTRITION Essentail Amino Stack is a supplement containing branched chain amino acids (BCAA) and almost all exogenous amino acids (EAA). The product supports energy processes, post-workout regeneration and protects the muscle tissue against catabolism. The packaging contains 500g of a convenient to use powder, available in several flavors. What distinguishes this product from other stacks containing amino acids is the addition of citrulline malate, which before the workout provides the effect of muscle filling and congestion, while used after training accelerates the regeneration process. L-Leucine - the most important amino acid that is part of BCAA, has the ability to control the course of muscle protein synthesis (MPS). The amino acid affects the secretion of insulin, which is a powerful anabolic hormone and stimulates the kinase of the mammalian target of rapamycin (mTOR), which encodes the process of protein synthesis. L-Isoleucine - another amino acid with branched side chain, has strong anti-catabolic properties. The amino acid is glucogenic and ketogenic which means that it can be converted into glucose or fatty acids if necessary. L-Isoleucine also increases exercise capacity because it improves glucose uptake in the muscles. L-Valine - the last BCAA amino acid, increases the resynthesis of muscle glycogen and supports the processes of energy production in the muscles. This amino acid, by affecting the level of neurotransmitters and decreasing the activity of tryptophan, delays the occurrence of fatigue. L-valine also participates in the transport of nitrogen in the body and the excretion of its excess. Citrulline malate - is formed from the combination of the citrulline amino acid with malic acid. It positively affects the energy level because malate is an intermediate product in the Krebs cycle. Citrulline also shows the effect of increasing energy production in the body. After consumption, citrulline is converted to arginine, which then forms a gas hormone - nitric oxide (NO). NO is responsible for increasing the lumen of blood vessels, which allows to better transport blood and oxygen and nutrients contained in it to the muscles. L-Phenylalanine - a trace amine that shows strong activity in the nervous system, regulates the level of neurotransmitters such as serotonin, dopamine, adrenaline and norepinephrine. It makes it easier to kepp proper focus on training and can suppress the feeling of pain, which facilitates the performing of a more intense training unit. L-Threonine - an essential amino acid for the course of collagen synthesis, which is a protein occurring the most abundantly in the body. Collagen determines the proper condition of the skin, bones, ligaments and tendons, which are overloaded during physical activity. This amino acid is also responsible for the proper functioning of the nervous system, delays the appearance of fatigue and is necessary for the proper functioning of the immune system. L-Histidine - participates in the formation of hemoglobin that is responsible for the transport of oxygen in the body. Along with beta-alanine, it forms a carnosine that increases muscle contractility because it acts as a hydrogen ion buffer in the muscles. Hydrogen ions accumulate during exercise and prevent proper shrinkage of muscle fibers, especially when oxygen supply is reduced. L-Methionine - essential for the proper course of methylation, responsible for reactions such as detox, activation or deactivation of genes, energy production and many more. This amino acid determines the proper functioning of the body, because it participates in the production of many essential substances in the body, such as proteins, glutathione, s-adenosylmethionine, phospholipids, glycosaminoglycans, collagen, L-carnitine or creatine. Vitamin B6 - participates in many enzymatic reactions in the body, including metabolism of nutrients and resynthesis of muscle glycogen. It determines the synthesis of neurotransmitters, controls the metabolism of collagen and regulates the level of glucose in the blood. In summary, XXL NUTRITION Essential Amino Stack is a composition of amino acids aimed at supporting energy processes during training and protection of muscle tissue against catabolism. The addition of citrulline malate increases the efficiency of the organism and oxygenation of tissues, thanks to which it will be possible to obtain the effect of muscle filling and vascularisation. The supplement will also be perfect as a support for the body after the training - it promotes the increase of anabolism and promotes the regeneration of connective tissue. One portion (5g) 45-60 minutes before training, the second portion (5g) immediately after training. Take around the training time- before, after, or during the workout. People with higher muscle mass may use doses slightly higher than those recommended by the manufacturer. Before training, the product should be combined with substances that increase the perceived energy level, such as caffeine, L-carnitine, creatine or beta-alanine. On the other hand, in order to increase the regenerative capacity, it is recommended to combine it with glutamine and a protein supplement containing a full aminogram. Acid regulator: citric acid, trisodium citrate, flavor (cocos, pineapple), emulsifier: soy lecithin, anti-caking agent: silicon dioxide, sweetener: sucralose, natural coloring: beta carotene. Extremely effective pre-workout formula for the most demanding users.